This is the simplest, healthiest, easiest to follow eating motto out there. Start the New Year not with a fad diet, but with motivation toward eating better. The first step is eliminating processed foods. Just stop buying frozen meals and baked goods that contain ingredients that you can't pronounce. The next step is eating less meat and more fruits and vegetables. You don't have to eat boil kale and raw tofu. Food should taste good. Healthy eating is not a punishment. Look at ethnic vegetarian dishes for inspiration for tasty non-meat alternatives: India, Thai, Chinese, Italian, Spanish, many other Mediterranean and Middle Eastern cuisine have incredibly tasty recipes that are meatless. Look at my sidebar under vegetarian for more meatless ideas. 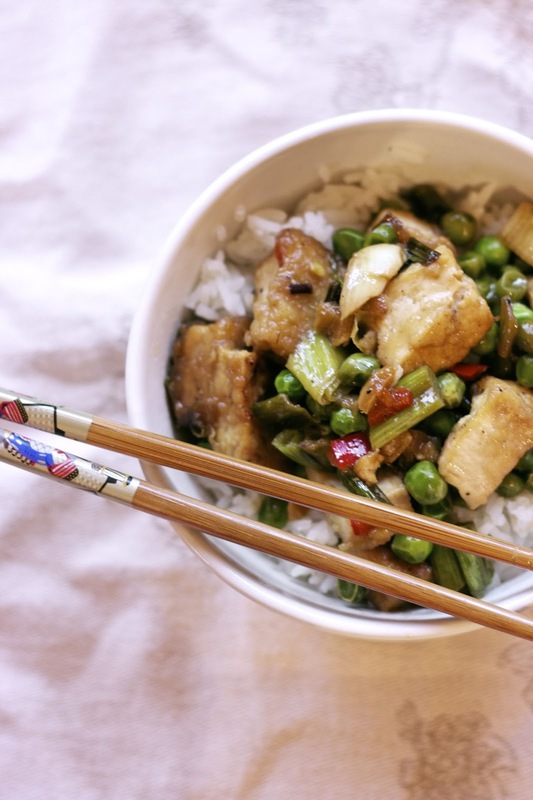 This tofu dish was inspired from Chinese cooking. It is so flavorful no one in my family mentioned or missed meat. To a Healthy, Happy, New Year... keeping it simple. 1) Wrap tofu in a towel and put it on a dish. Put another dish on top of it and lay a heavy book on top of the dish to press the liquid out of the tofu. Leave this while you prepare the rest of the ingredients. 2) In a small bowl whisk together the sauce ingredients. Set aside. 3) In a wok or large skillet heat 1 tablespoon of butter and 1 tablespoon of canola oil on medium high heat. 4) Chop the tofu into cubes. In a gallon size plastic bag pour 1 tablespoon of cornstarch. Add the tofu to the bag and shake. 7) When the oil is hot place cornstarch coated tofu in the skillet. Do not move pieces for 4 minutes. Brown on all sides, about 3 to 4 minutes per side. 8) When all of the tofu is browned add the peas, peppers, and scallions along with the sauce into the skillet. Mix, heat through and serve over rice or rice noodles. Meatless Monday: Little Quinoa Patties topped with Sour Cream and a Green Salad, Red Onions, and Cucumbers. Will be sending this on to Emma (14-year old vegetarian grandchild). 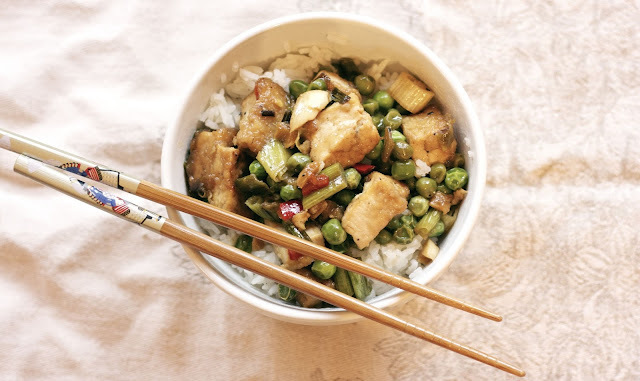 She and Clara (12-year old non-vegetarian grandchild who likes Tofu) will really enjoy this recipe. And, for me, I'm going to jump on the Tofu bandwagon (at least once) in 2016. Thanks for the inspiration, Diane. Happy New Year to you and your family. I'm sure they will like this one. My daughter loves tofu and my son can take it or leave it, and he really loved this recipe. Happy New Year to you Mary. This sounds delicious, Diane! Love the warming flavours and fresh ingredients. I agree, healthy eating can be such a pleasure. Your weekly menu sounds really wholesome and tasty too. Thank you for bringing this post to the Hearth and Soul Hop. Sharing! Wishing you a healthy and delicious New Year! You are so welcome April. Good luck with your vegan month. This is a great dish that my granddaughters will just love and your menu looks awesome, Diane. I sure hope that all of you are ready for the big snow storm coming your way this weekend. Hope you stay warm and cozy! Thanks so much for sharing with us at Full Plate Thursday this week. Hope you are having a great day and come back soon! Oh, yes, I remember that you have granddaughters who are vegetarians. I hope they enjoy it. We are excited to get some snow. We haven't had more than a dusting all winter.